Those who live and/or work in one of California’s urban areas will have likely noticed an uptick in the number of homeless individuals on our sidewalks and streets. Most of us are also familiar with the growing number of families, seniors and persons with disabilities struggling to make ends meet and to live in decent, affordable housing. Learn more about the state and local ballot measures so you can make an informed decision. Several statewide and local measures on the November 6 ballot would, if passed, bring some much-needed support for affordable housing. At the top of the ballot are two statewide measures, Propositions 1 and 2, which address issues of affordable housing and homelessness. 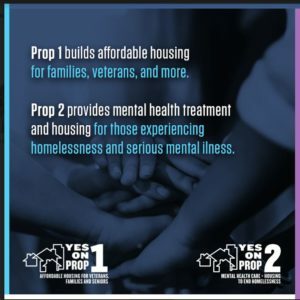 Proposition 1 would create a $4 billion bond to build and create more affordable housing for veterans, working families, people with disabilities and seniors, while Proposition 2 would allocate $3 billion from already existing funds to focus on people suffering from serious mental illness who are experiencing homelessness. Also on the ballot is Proposition 10, which would repeal California state law that currently restricts the scope of rental control policies cities and other local jurisdiction may impose on residential property. A yes vote would mean state law could not limit the kinds of rent control by cities and counties. Berkeley – Measure O seeks to issue $135 million in general obligation bonds to create and preserve affordable housing for low-income households, working families and individuals including teachers, seniors, veterans, the homeless and persons with disabilities. Napa – Measure F would adopt an ongoing transient occupancy tax (hotel tax) of 1% on hotel charges to visitors of 30 days or less, increasing the maximum hotel tax rate from 12% to 13%, with all revenue from the new tax (estimated: $2,100,000 annually) to be restricted to providing programs and services for affordable and workforce housing in the City of Napa. National City – Measure W would enact rent control, including the establishment of just cause eviction regulations, rent stabilization and a rent board. Oakland – Measure Y would amend Oakland’s Just Yes Cause for Eviction Ordinance to remove the exemption for owner occupied duplexes and triplexes and would allow the City Council, without returning to the voters, to add limitations on a landlord’s right to evict. Oakland – Measure W would fund homeless services and resources to address illegal dumping and discourage vacant properties by enacting a Vacant Property Tax on parcels used less than 50 days per year, at annual rates of $6,000 per parcel, $3,000 for condominium units, and other specified rates; raising $10,000,000 annually for 20 years with community oversight and exemption for very low income seniors and hardships. San Francisco – Proposition C, known as the Our City, Our Home initiative, would levy an average of about 0.5 percent in gross receipts tax on corporate revenues above $50 million. The estimated $300 million raised would be used to fund homelessness services, primarily programs that help people access permanent, supportive housing. Santa Cruz – Measure M would amend the city charter to establish a rent board and to enact local rent control and eviction limitations. Santa Rosa – Measure N, the $124 million Housing Recovery Bond Measure, would construct and preserve affordable housing for low-income and moderate-income families, veterans, seniors, persons with disabilities, persons experiencing homelessness and other vulnerable populations within the city of Santa Rosa. Santa Clara – Measure A would continue the existing one-eighth cent sales tax on an ongoing basis, estimated to raise $50,000,000 annually, to fund local priorities, including affordable housing and supportive services for the homeless. Santa Cruz – Measure H would authorize the county to issue up to $140,000,000 in general obligation bonds at an estimated tax rate of $16.77 per $100,000 of assessed value to fund housing for populations such as households at or below 120 percent of the area median income, veterans, seniors, persons with disabilities, persons with mental health disorders, and persons with substance abuse disorders. Let’s all do our part and vote either by mail or in person November 6. Your vote can and will make a difference.